OK so pedalling into winds of 30 kph gusting to 50 isn’t a lot of fun but the return trip is pretty good. The day started with a drive to Jarvis Bay Provincial Park on Sylvan Lake to meet up with Michel from Calgary who is also doing the Tour du Canada this summer. We had connected during the winter through the TdC online bulletin board and had planned to meet at some point for a training ride. 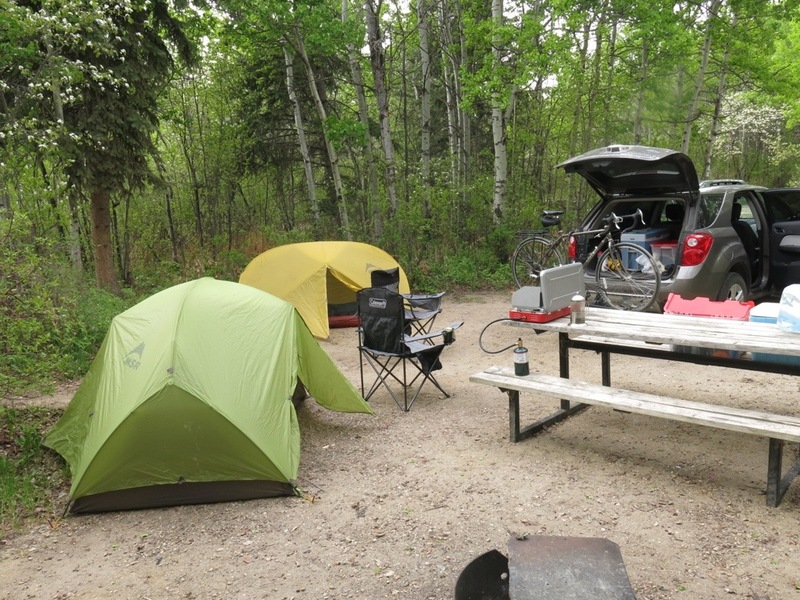 We had finally settled on today (Wednesday) and tomorrow and decided to camp overnight at Jarvis Bay. Shortly after 10:00 am we met up in the parking lot, unloaded our bikes and headed off. With strong SE winds we chose to pedal south and have the wind behind us on the return trip. 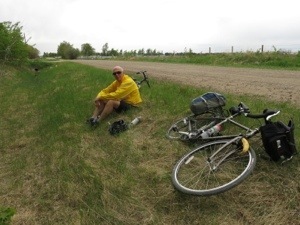 After 35 km of hard pedalling we found a sheltered spot by some trees at the side of the road for lunch. By now we had enough slogging into the wind and started back to the campground. We soon had our tents set up and were settled in. By the time we got our tents up the wind had died down and it turned into a pretty nice evening. For dinner I got to try out my new propane stove and fried hamburgers. Pretty tasty after a ride! The propane stove is sure a lot easier to use than my old Coleman liquid fuel stove. After dinner, with the dishes done, we sipped hot chocolate as we chatted and enjoyed the peacefulness of the campsite.